The Kentucky Folklife Program is housed within the Department of Folk Studies and Anthropology at Western Kentucky University and works closely with the department to create opportunities for student to be involved in public folklore work. More info here. The Kentucky Museum is located in the Kentucky Building on the campus of Western Kentucky University. The Museum houses six major permanent exhibits and several changing exhibits. There is a variety of partnerships, services, opportunities, workshops, camps and other outreach provided to the public each year, several of which are produced in partnership with KFP. Visit their website. 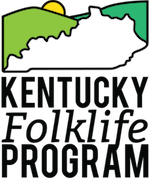 The Kentucky Folklife Program has an ongoing partnership with the Kentucky Arts Council through the Community Scholars program and the Folk and Traditional Arts Apprenticeship Grant. Visit their website. The Kentucky Folklife Program has maintained a partnership with Kentucky Historical Society since moving to Western Kentucky University in July 2012. Visit their website. Begun as a two-year project with WKU Folk Studies students working to document folklife in Allen County, Kentucky, KFP has continued to build on this work through collaborations with Allen County High School and Community Scholars Training. Visit their website.